Nothing can quite match the expressive qualities of a well executed wheel cut glass surface and at Glasszoo we use both traditional stone and modern diamond cutting wheels to create designs on blown, cast and kiln formed glass. The cut surface can be left in its rough translucent state or further smoothed and polished until the surface shines and refracts light with a sparkling brilliance. 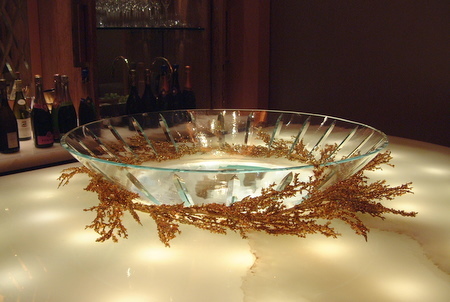 Cut Glass Champagne Bowl in Calton Towers Hotel London.